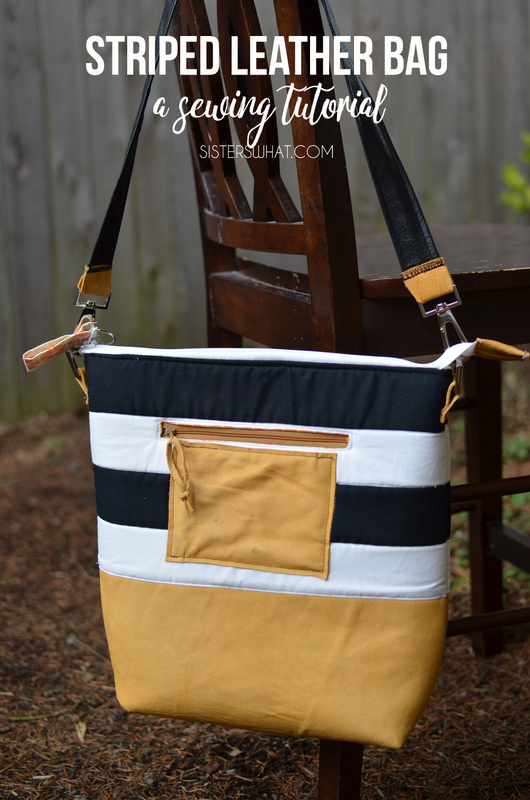 ' Striped Leather Bag [Tutorial] - Sisters, What! A while ago, I found some scrap leather at a garage sale. As I tried to figure what I would do with it, this bag came into focus. I based it off a bag I made last year (see here), but this time I perfected it. The best part is that it was easy. Last week I shared this tutorial on The Ribbon Retreat Blog and now today I get to share it with you. //2// Iron the seams down. (white towards the black so that it doesn't show through the white). 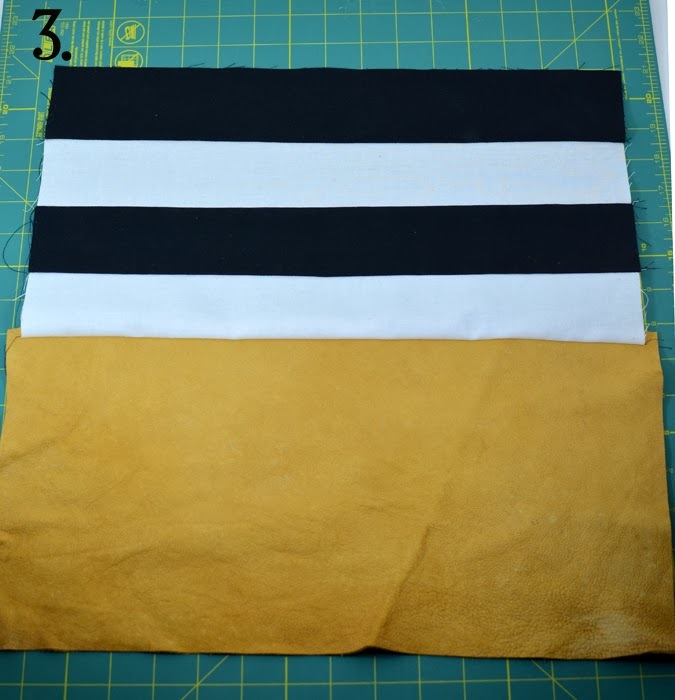 //3//Sew the leather/vinyl piece to the striped black and white piece. Make sure to hold tightly to the leather and use your leather needle. //4// *see step 5 first. 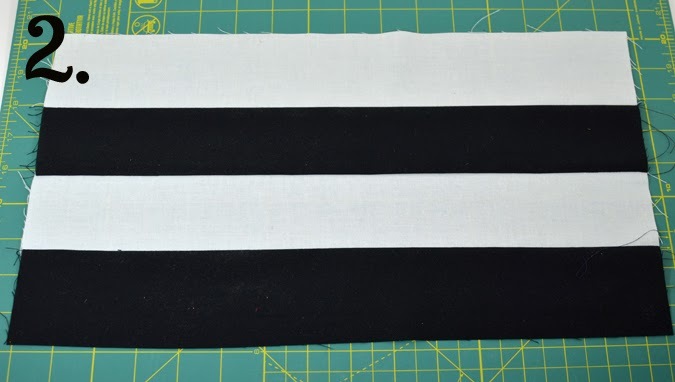 Pin your batting pieces to both sides of the black and white exterior pieces. Pin very well and quilt in the ditch between the black and white (go here for a great tutorial on quilting in the ditch. 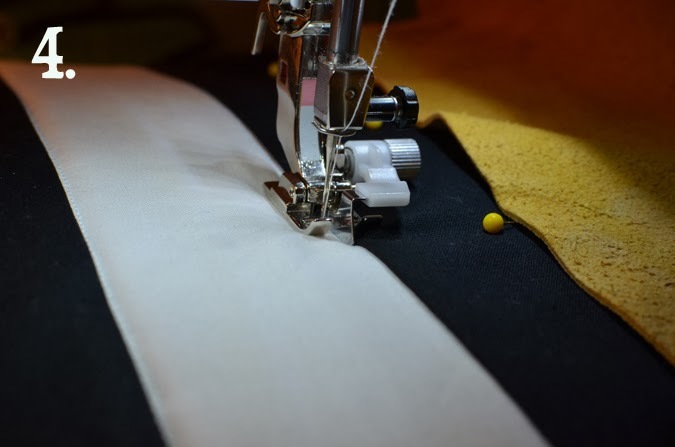 I used the blind stitch pressure foot to do this, which made it very easy to stay in the 'ditch'. //5//a If you want a zipper on the outside, go HERE for a tutorial. I was going to do a tutorial for you, but there are so many excellent ones already out there. 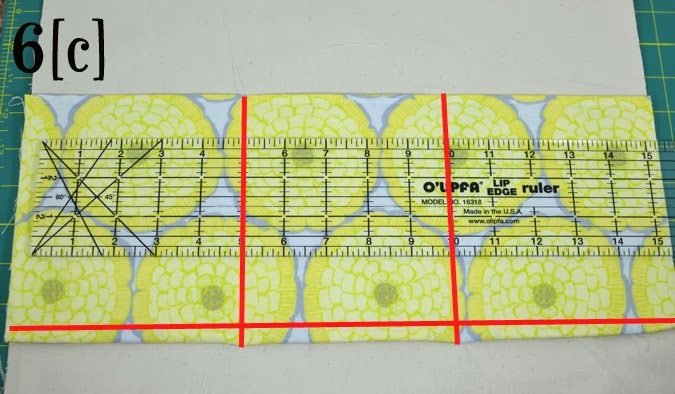 (c) grab one of your interior duck cloth and measure from the top 5 and 1/2 inches and place your pocket piece there. 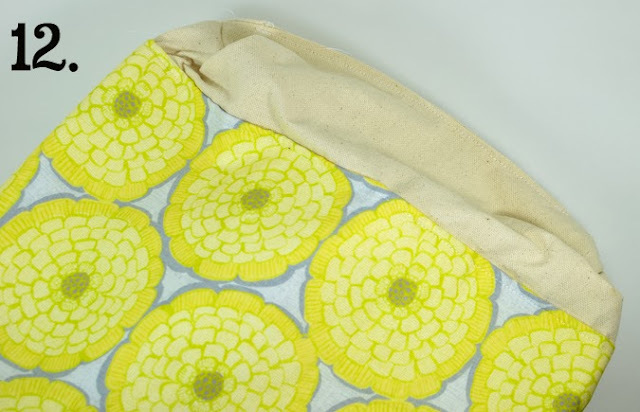 First sew your bottom part of the pocket to the duck cloth. 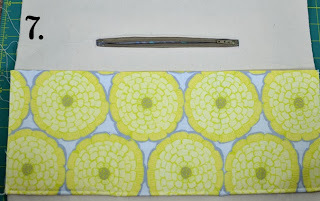 For the pockets, measure in 5 inches and sew a line and then measure another 5 inches and sew another line. //8// Okay, it's time for assembling the whole thing together. Get excited, you are almost done. Grab your zipper and the pocket side exterior piece. 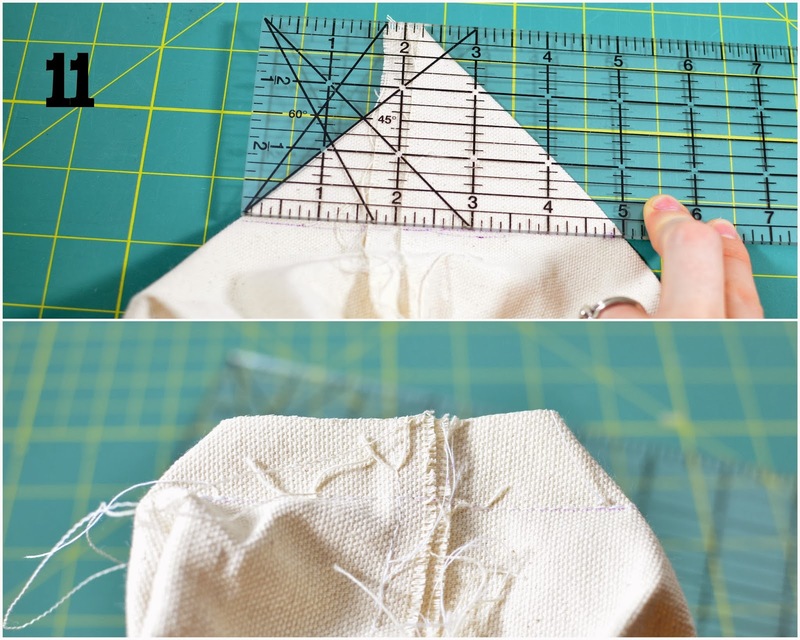 Lay the zipper so that the teeth are facing the outside of the exterior piece Then take the top part of the zipper and fold it 90 degrees up and pin (as seen in the above picture). 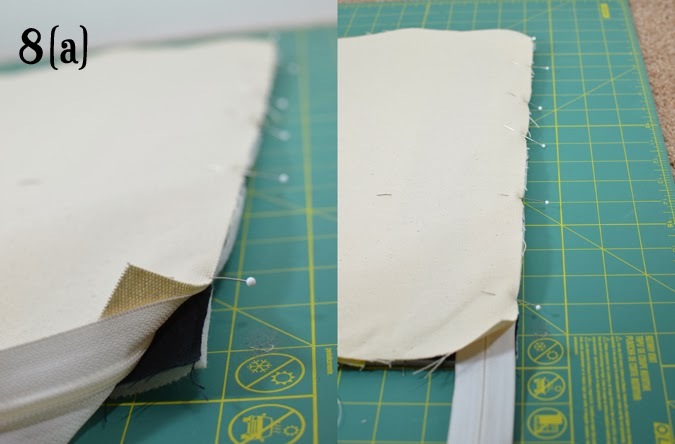 //8// (a) Lay one of your finished interior pieces on top of the zipper piece and make a zipper sandwich (make sure the exterior and interior's RIGHT sides are touching). Pin in place. Make sure to put your last pin an inch from the end. 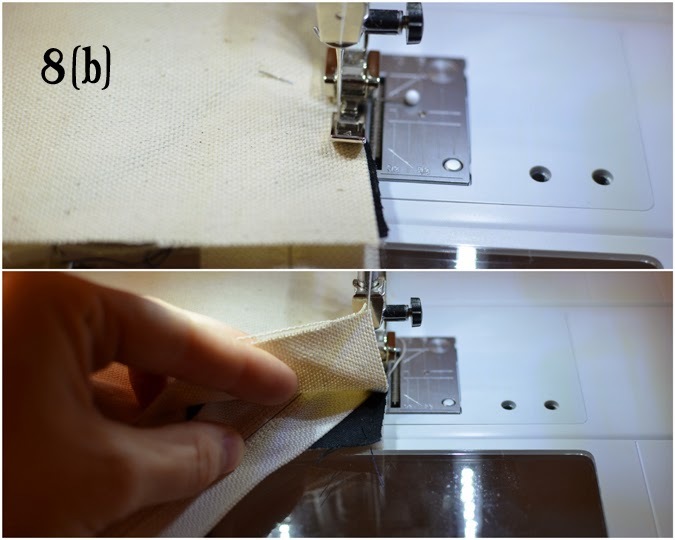 (b) using your zipper foot sew all the way until the last pin (which should be an inch from the end). At that point pull the end of the zipper away from the raw edge (out of the reach of the needle's path) and continue sewing until the very end. 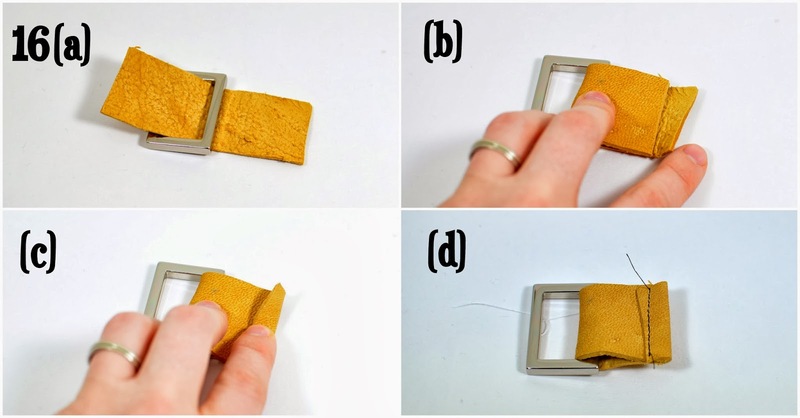 Basically, you want the last inch of the sandwich to not be sewn to the zipper. 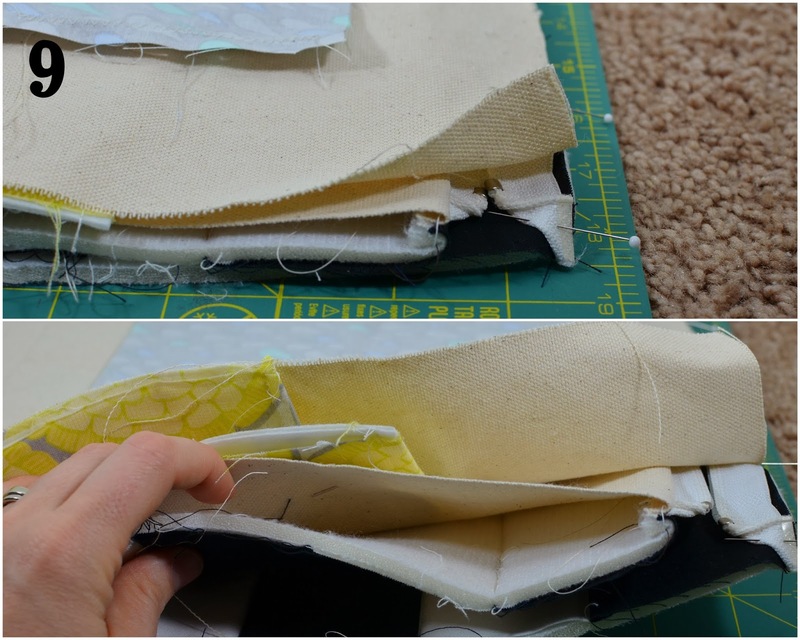 After you finish sewing, turn your two bag pieces so that the wrong sides are now touch and the right sides our facing out. After your done, flip everything so that wrong sides of exterior and interior pieces are touching. Looks great. Almost done. DON"T TOP stitch the zipper part YET. That comes later. //10// zip your zipper so that it is half way zipped. Now lets do some more flipping. Flip your exterior pieces so that both RIGHT sides of the exterior pieces are touch and flip the interior pieces so that both RIGHT sides of interior pieces are touching. Pin all the way around. 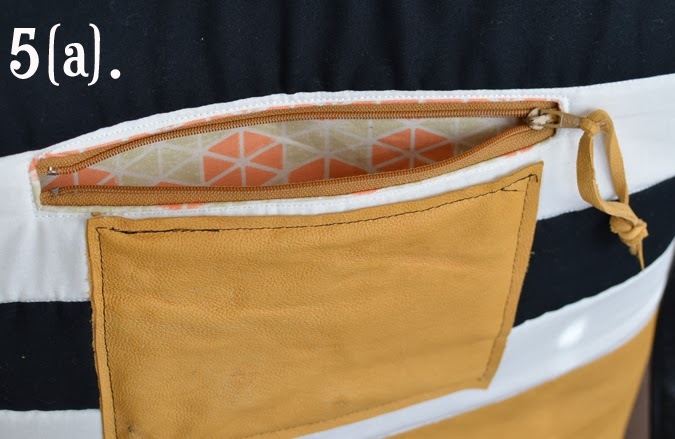 MAKE SURE your end zipper piece is tucked well inside the whole pieces (we don't want it to get sewn up. 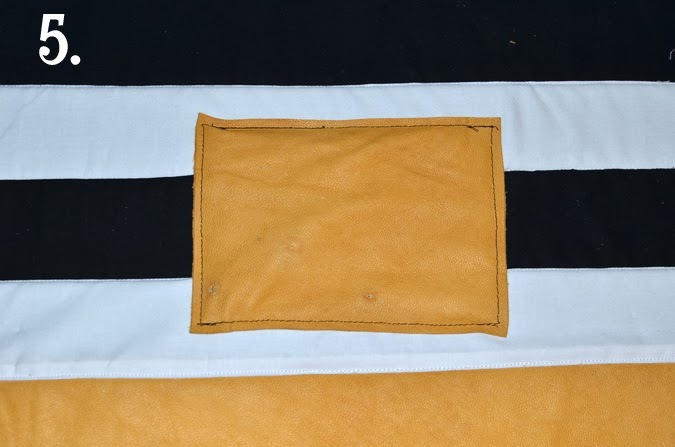 Next, starting on the interior side and sew all the way around back to the interior side but make sure to leave open a big gap. //11// to make it boxy, we're going to box the corners before we turn the whole thing right side out. 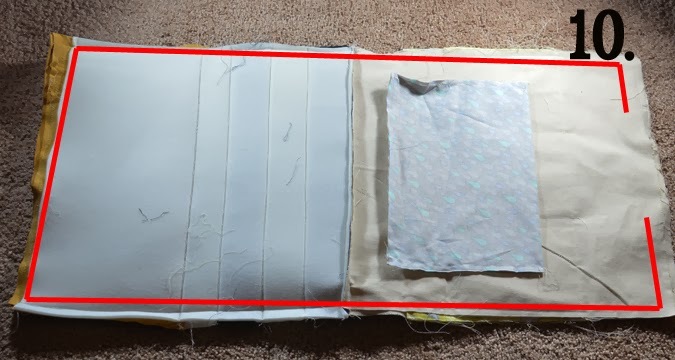 Box the corners by pinching each corner together and aligning the side/bottom seams. Grab a ruler and pen and mark out 4 inches (i know my picture shows 5 inches, but I ended up doing 4). 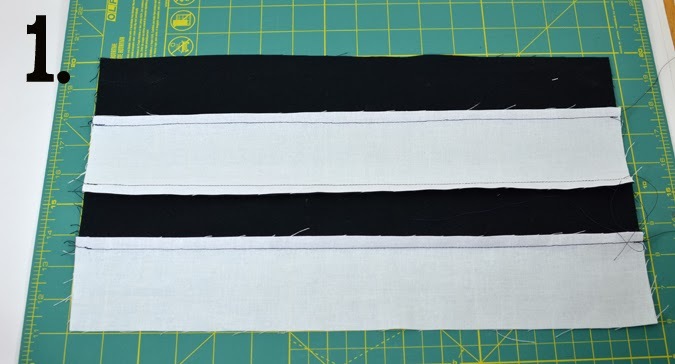 Then sew on that line and cut the corners. Do this for both the interior side and the exterior side. 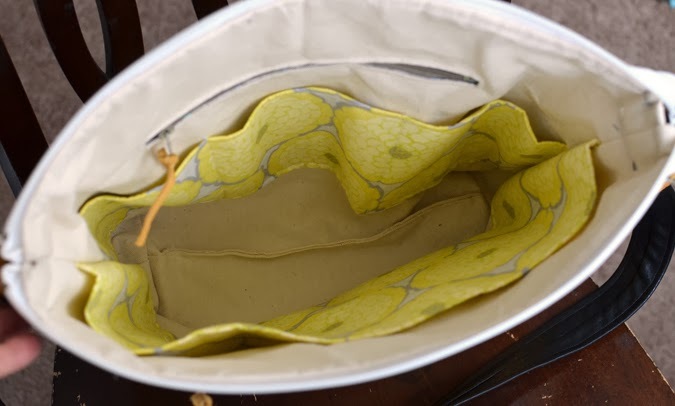 //12// now turn it right side out but before you stuff your interior piece back into the bag, sew the hole up in the bottom of the bag. Then stuff it into the bag. //13// Now we're going to top stitch the top of the bag. Carefully going around the whole top, while avoiding the end of the zipper. 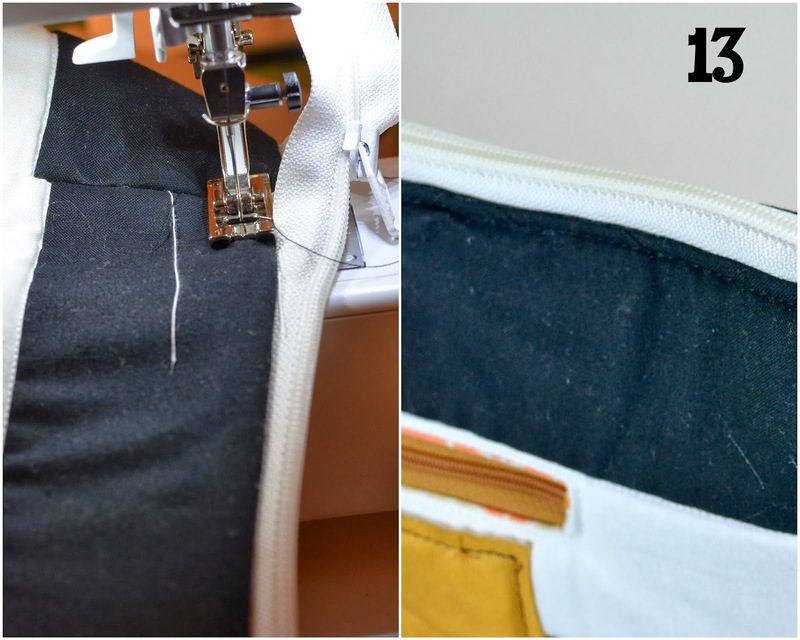 //14// for the end of the zipper, cut it to your desired length (be careful not to pull the zipper off while you do this). 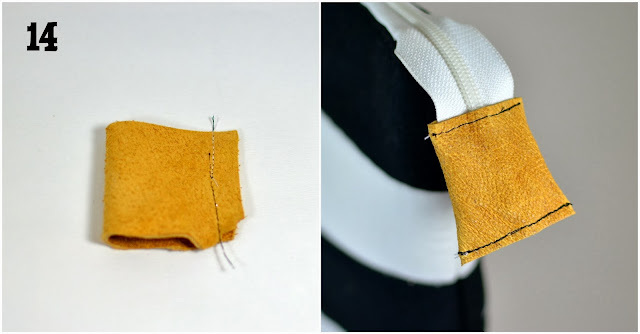 Measure the leather on the zipper and turn it right sides together and sew. 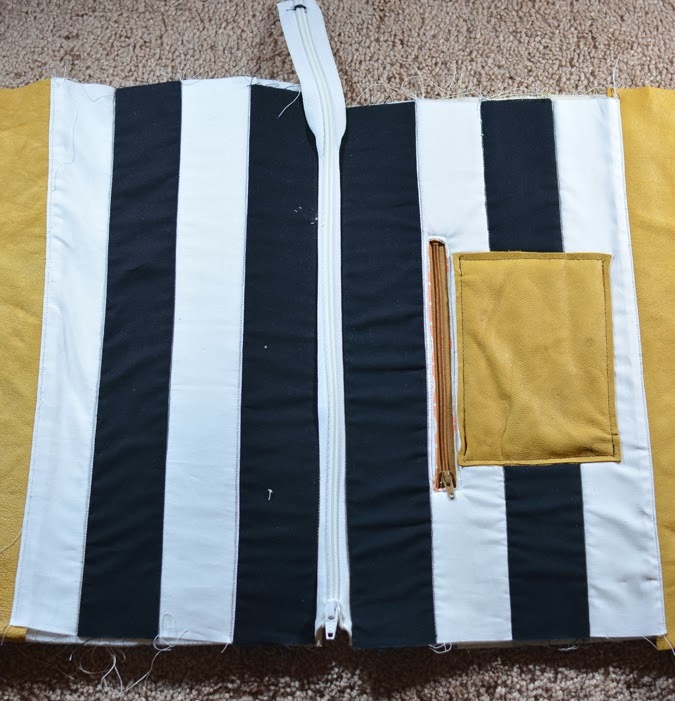 Then turn it right side out and attach it to the end of the zipper. 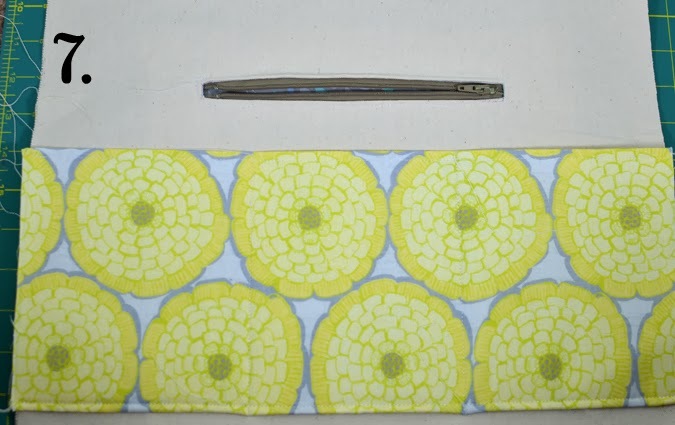 Then sew it on to the end of the zipper. 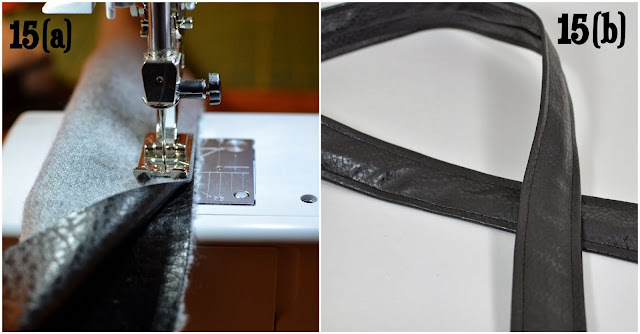 //15// (a) grab your strap leather/vinyl piece and sew it in a tube, right sides together. Then the best part, turn it right side out. Actually this was a beast of a thing. I asked the husband to do it and he did it like a champ. He ended up using the leg of my music stand to push it through. Good luck. (b) After you've accomplished the feat of turning it, top stitch on both sides of the strap. 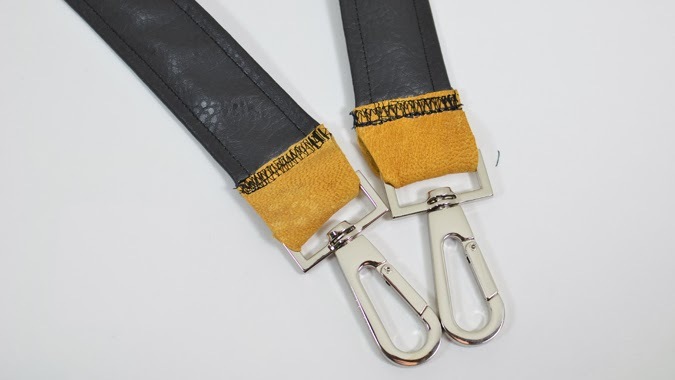 Now grab your leather pieces for the straps (the 3 x 2.75 ones). Wrap them around the swivel latch and attach them to the end of the strap pieces. I wanted it super secure and did some crazy zig zagging. You can be super awesome and match your thread with the leather...I didn't have the same color so I went with the contrasting black. It kind of looks cool, right? //16// grab your D ring and small leather pieces. 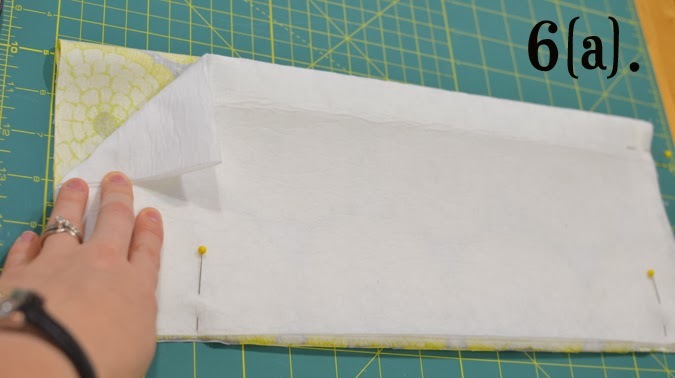 Bring it around, fold it up and then sew it closed. Then sew it to the side of the bag. Repeat for other side of the bag. And after all those crazy and detailed steps. YOUR DONE!! I'm totally impressed! What a cute bag! I can't believe you MADE this! incredible. LOVE. THIS. Thanks for making it into a tutorial! Ooh! This is super fun! This is AMAZING. The bag is stunning, and your tutorial is so helpful! I'm not so great with the sewing myself, but now I really really want to make one :) Visiting from The Makers link party! gorgeous. love the color combo. fabulous bag! is there such thing as having enough bags? I'm in the process of making this and I can't figure out what size zipper I need for the top of the bag. Am I missing it? I WANT this bag! I love the combination of leather and stripes! Thanks for the awesome tutorial! I think I need sewing lessons pronto!!! I am so in love with this bag. What are the finished dimensions? Thank you so so much for taking the time to do this tutorial!!! 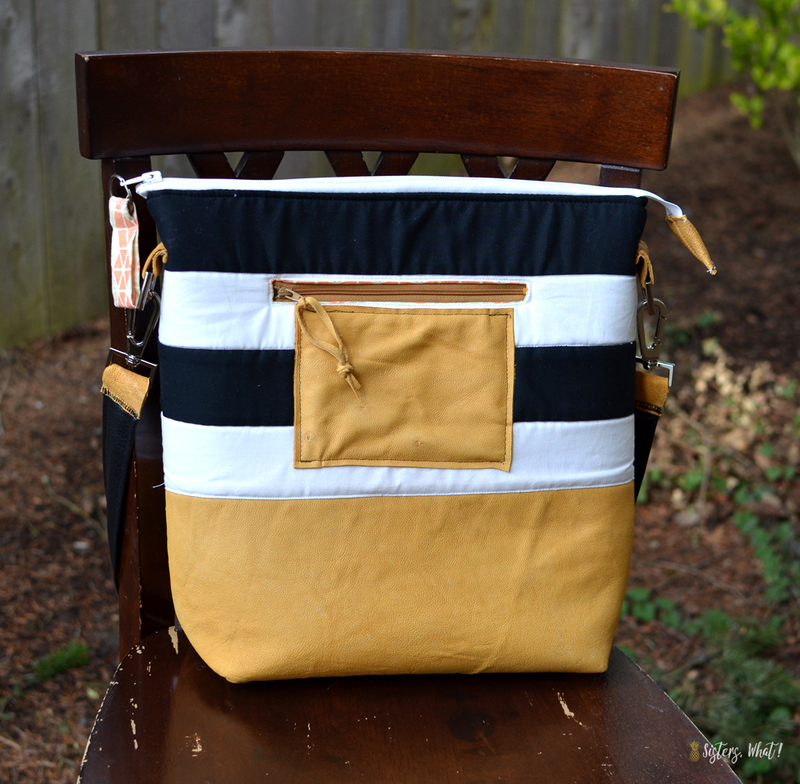 I LOVE this bag and cannot wait to attempt it!